A new law in Oregon, House Bill 2597, went into effect last October. This new law closes a loophole present in the state’s previous attempt at a distracted driving law, which was enacted in 2009. That law prohibited drivers from calling and texting with mobile devices, but only those functions according to a court decision. A loophole in the existing law allowed drivers to play games or program a navigation app with no legal repercussions. This loophole is now closed and the law better defines how a driver can interact with their smartphones and other devices. 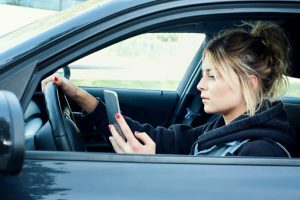 What constitutes distracted driving in Oregon? Drivers are not strictly prohibited from using their devices behind the wheel; however, any use is restricted to a single swipe. This limitation allows drivers to close apps or change a song. Hands-free devices are also allowed, as are ham radios for licensed amateur operators over the age of 18. Drivers under 18 are not allowed to use any devices, hands-free or otherwise. Drivers should always have their hands on the wheel and their eyes averted for a minimal amount of time. If drivers need to perform more complex tasks that require significant attention, they are now expected to park safely before doing so. The car does not need to be off, but sitting at a red light does not count and use of a device is prohibited. The exception to this rule is to dial 911, as drivers are allowed to call emergency services if no one else in the car is able to do so. Under the previous iteration of the law, drivers were fined $160 for each violation with no escalation for recurring offenses. This means that there was little incentive for some drivers to learn from their mistakes if they felt they could afford the fine. These drivers may now think twice under the new law, which includes escalating penalties and a harsher penalty for the first infraction. Under the new law, first-time offenders will be fined $260, which rises to $435 if the distraction results in an accident. The fine can be waived if the driver agrees to take a distracted driving course, but the violation will remain on their record. The second offense is also a fine of $435 and the third within ten years will result in a misdemeanor charge. The misdemeanor can result in up to six months in jail and a $2,500 fine. If you or someone you know was the victim of an accident caused by distracted driving, it’s best to seek the legal advocacy of an experienced auto accident attorney. Consult with Zbinden & Curtis, Attorneys At Law today and find out what we can do for you.